Hebrews 11:1-2 Now faith is confidence in what we hope for and assurance about what we do not see. A message of encouragement from CfUT’s Executive Director, Krysta DeBoer. The person with the most hope will always have the most influence. Few functions of a leader are more important than that of keeping hope alive. During times in which others are lost in a dark pit of despair, effective leaders will infuse those around them with optimism regarding themselves, others, and the future of the organization. If we are going to lead fearlessly and love hard, we need to take an extra dose of hope daily. One of the greatest tragedies in our field today is that we are hope deficient. We no longer believe that the things we want to see in our classrooms, in our community, and for our children will succeed. As our list of wishes and wants grows, our vision for what is possible shrinks and our expectations lower. It is heard in the long list of excuses made when confronted with data demonstrating failure and phrases beginning with “I can’t,” “I refuse,” “I won’t,” or “I don’t have the time.” It is visible in the shrugging of shoulders, eye rolls, and throwing up of hands as we carelessly word vomit and spread our list of doubts and demands like a bad virus throughout our schools disguised as hopes…“Hopefully he’ll/she’ll/we’ll (fill in the blank)”… without any real expectation that what we are saying will come to fruition. Hope requires not just desire, but an expectation, confidence, and belief that what is hoped for will be fulfilled. The two things that tend to cause a sense of hopelessness are delay and discouragement. The book of Nehemiah highlights these two major sources of hopelessness as Nehemiah works to rebuild the walls of Jerusalem. This work was important at this time because a wall was a city’s main line of defense against raiders and other enemies. Let’s look at the first cause of hopelessness: Delay. One of the greatest dangers of “time in” is a reduction in “hope for”. In Nehemiah 4:6, it says, “So we rebuilt the wall till all of it reached half its height, for the people worked with all their heart.” Do you know when you are most apt to begin to lose hope? When you are halfway into a project. Notice how in v. 6 it says that at first they worked with all their heart. Everybody works hard at first because it is exciting, but eventually the newness wears off, you settle into a routine, and then find yourself in a rut. Don’t think that this applies to the field of education? 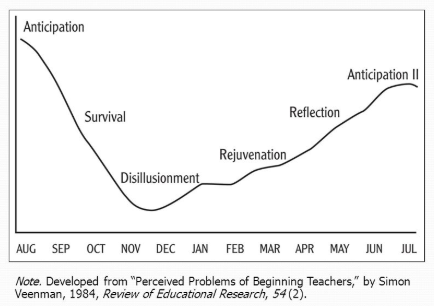 Take a look at the chart below that describes the phases of teacher development. At what point during the school year are teachers at their lowest point? Bottom line: If you dare to dream big, you better be prepared to think long. Refuse to be a victim of time in. Like a pregnant mother, our expectancy of the thing hoped for should grow with each additional day we wait. The first is source of discouragement is Fatigue. In v. 10, it says, “The strength of the laborers is giving out.” The people had worked themselves to the point of exhaustion. Sometimes we make the mistake of ruminating on our troubles trying to figure out why we feel the way we do when the answer is simple, you need to rest or as Steven Covey says “sharpen the saw”. When fatigue walks in, hope often walks out. Bottom line: If you get tired, learn to rest instead of quit. Just like the despair of delay, fatigue often shows up about midpoint. The second is Frustration. Continuing in v. 10, it says “and there is so much rubble that we cannot rebuild the wall.” Even though the Jews were working to build a new wall, they were so overwhelmed by the amount of debris or trash they had to clean up beforehand they became discouraged and lost sight of their goal. Bottom line: You need to make time to take out the trash. Nobody else is going to do it for you. This is a necessary part of the process any time you work to rebuild, reform, or refine something, including, but not limited to, a school, a staff, a culture, a curriculum, or student achievement. The third is Failure. Look again at the end of v. 10, “we cannot rebuild the wall.” Since the workers were unable to complete the task, a task they had never done before, as quickly as they had planned, they began to give up. Rather than adjusting the anticipated deadline or strategy for completing the project, they were ready to abandon all hope proclaiming the project mission was not possible. Question: How do you handle failure in your life or work? When you are at your lowest, do you tend to hold a pity party, rain complaints, or play the blame game? All of us are prone to one of these in tough moments. If you are not sure, ask a trusted friend. The difference between winners and losers is that winners see failure as a temporary setback. Winners know that the greater the challenge, the greater the opportunity. Bottom line: You can be pitiful or powerful, a victim or a victor, an encourager or a complainer, but you can’t be both! Decide which you want to be and behave accordingly. The fourth is Fear. Nehemiah 4:11-12 says, “Also our enemies said, ‘Before they know it or see us, we will be right there among them and will kill them and put an end to the work.’ Then the Jews who lived near them came and told us ten times over, ‘Wherever you turn, they will attack us.’” Why did those cited as enemies oppose the rebuilding of the walls of Jerusalem and seek to incite fear? Resentment. The wall guaranteed Jerusalem’s prosperity and protection. Ultimately, it created unwanted competition for their enemies. What has created opposition in relationship to what you are trying to rebuild, refine, or reform? Notice who becomes afraid first in v. 12. It was the Jews who lived near the enemies. We all know attitudes are contagious. When you hang around negative people long enough, you become negative. When you repeatedly listen to someone saying, “It can’t be done,” eventually you start to believe it. Bottom line: Choose the company you keep wisely. Avoid people who strengthen your fear and align yourself with those who build up your hope and faith. Press in, press on, and do it afraid! In the late 60s, a psychologist and a school principal did a remarkable study in which they told teachers that on the basis of a bogus psychological test some of their students were “late bloomers”, meaning that even though they hadn’t shown academic success yet, they would bloom. The amazing thing is that in a very short time the teachers began to treat those children differently than the others, those scholars then began to think of themselves differently and act in accordance with the hopeful expectations of the teacher, and in the end performed significantly better than their peers. They were transformed by the teacher’s hopeful expectations. Hope matters! Your impact is directly proportional to the amount of hope you possess because hope reveals beliefs and beliefs always, always guide your behaviors. I once read a story about a rural farming community that was hit by such a severe drought that the local church called a prayer meeting. As the pastor stood before a packed church he noticed an eleven-year-old girl beaming with excitement in the front row. Lying on the pew beside her was a big orange umbrella poised and ready for use. Looking at the congregation, he announced, “The rest of us came to pray for rain, but she came expecting God to answer!” No one expects a young child to be the example for the adults in the room, but this little girl proves the point perfectly. The person with the most hope will always have the most influence. Hope believes. Hope expects. Hope trusts. Hope envisions. Hope prepares. Hope pursues. Hope perseveres. Hope influences. Hope leads. What can you do to increase hope for yourself and others? Recognize and refute the symptoms of delay and the four sources of discouragement outlined above. Think long and embrace delay. Learn to rest instead of quit. Make time to take out the “trash”. Fail forward by seeing the opportunity in every challenge. Avoid people who strengthen your fear and align yourself with those who build up your hope and faith. Write a vision for yourself, your classroom, and your school that is hope-filled and bigger than you and your current circumstances. Ensure your words reflect a vision that breathes hope into your classroom, school, and city. Like it or not, your words reflect what is inside. They are the overflow valve of your heart. Consider ways in which you can be an encourager to others and fill them with hope. A phone call, a brief note, or a personal word of encouragement or thanks requires little time, but yields exponential benefits. Bring your “umbrella”. Show up like you expect your hope to be fulfilled. Embrace and pursue the impossible. When you no longer believe nothing is impossible, leave.